The versatile sari is being spiced up in many ways to make it stand out out. While there are many edgy ways to style the six yards, one which has caught my attention is wearing cape over it. Sonam Kapoor (who else?) started it off at Cannes Red carpet with her Anamika Khanna saree gown which was finished of with a sheer cape over it. Adding a cape is a great way to give the traditional saree a modern twist and make your look stand out. 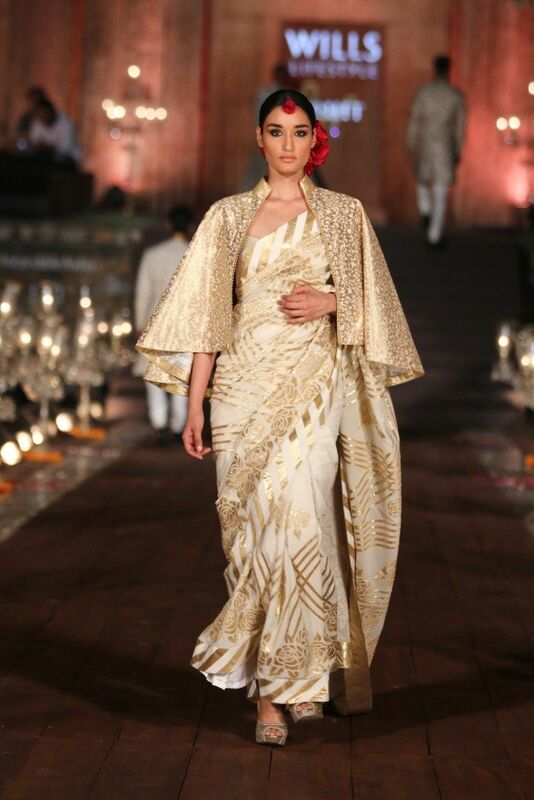 Recently at Bulgari Launch event sonam kapoor wore another anamika khanna saree with a cape. I totally loved this look head to toe (and blogged it on my blog, read detailed post here ) and decided to do more research on this trend and voila this post was born . 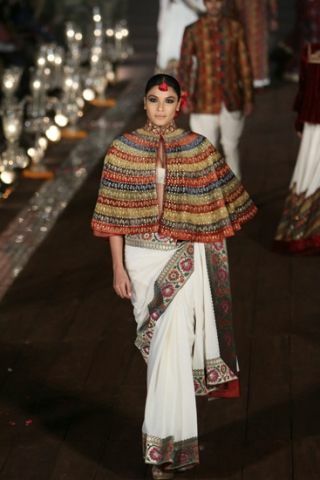 It isnt only Anamika Khanna who has been playing with this trend . Masaba gupta also projected a version of the printed cape on a saree in her recent collection. This months Harpers Bazaar Bride features kareen kapoor khan in cape by gaurav gupta over a black saree. The cape is just not limited bollywood, South indian actress Samantha also wore a beaded cape over a royal blue saree at an event. I loved how simple yet striking this look is all thanks to the cape. The cape can look very both chic and royal if done rightly. Sonam Kapoor wore this elle sabb shrug kind of cape over a pink saree and looked Ethereal in it. I also love this gorgeous jeweled Cape on saree, by Monisha jaising at Delhi Couture Week . blingy and jewelled capes like this over a saree could easily make you stand out as a guest in a wedding reception. Royal. Id wear it in the blink of an eye. Does the Cape on saree trend intrest you? How would you wear it? please do share in comments .